I have a horrible secret. I’ve let my artistic skills go. The current banner is a huge testament to how far I’ve let them go. Just the same I’ve gotten back on my painting saddle in hopes I could finish a painting I started years ago. I know some of you are already cringing and wondering why on earth I’d bother with such a horrible idea (for what it’s worth I used acrylics then and now). I assure you after salvaging the painting I’m wondering why I bothered as well. I made another horrible mistake in talking about my project (humor me) on facebook. People grew curious and asked for photos. After a bit of thought I figured I’d comply, only to find my batteries in my camera died. While the batteries recharged I worked a little more on my salvage. In time, spilt acrylic paint, and two charged batteries later I found a satisfactory stopping point. I’ve decided to take a picture and show the world my work-in-progress, though honestly it should be a “throw-in-the-towel already”. I decided to keep up the tradition of cropped, blurry, out of focus pictures at Upholding Ma’at with this unveiling. 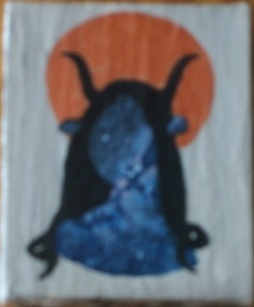 It is a picture of Het-Hert where I depict Her in the form of the Celestial Cow. I decided to use a part of the arm of the Milky Way to further convey this point. I’m not sure what I’ll do with the painting once it’s finished. I may stuff it somewhere, embarrassed by my poor skill. Maybe I can auction it off for more funds for craft projects and for upcoming books. Perhaps I could donate it for some worthy cause, like preserving bad art for future generations. I may paint over it and start again. I think I shouldn’t deviate from my stick drawings anymore and leave it to the professionals. Categories: Craft Friday | Tags: bad art, Craft Friday, humor, Kemetic, NeoPagan, painting | Permalink. I learned about a holiday that dates back to Ancient Egypt: Shamm el-Nessim. According to this article the “inhaling the breeze” was celebrated since Ancient Egypt. What seems to be known about it in ancient times is it’s a time where onions, fish, and eggs were offered (one article indicates it was Sokar, but it doesn’t cite sources). According to the article I linked to, eggs were dyed the night before. Wishes were written on the decorated egg and left in a basket outside the house. I haven’t really found other information on the holiday’s origins, though the wikipedia entry seems to elaborate that lettuce was also offered. It also adds that it was originally The Feast of Shomu, so that gives a rough idea when it was celebrated and rather than a holiday associated with Sokar is most likely associated with The Return of the Wandering Goddess. According to the aforementioned blog this festival was observed around the time the sun aligned with the pyramids, signifying the springtime started. Beyond this information there’s a tale about the significance of onions associated with this holiday. A pharaoh had an ill child (two blogs seem to conflict; one says a son, the other a daughter) who was cured by a priest using onions. In honor of the event the pharaoh made the occasion a holiday. Knowing this much indicates a few holidays for me if it isn’t a festival for Sokar nor the Return of the Wandering Goddess. Despite the lack of information on how the Ancients celebrated, there is plenty of information on how the holiday is celebrated today. Today Sham el-Nessim is celebrated the first Monday after Easter is observed by Coptic Christians. This particular holiday is celebrated in modern times the Monday following the Coptic Easter Sunday. In the morning Egyptians prepared their breakfast. This consists of a cured fish, eggs, onions, lettuce, and cucumbers. According to Food of Egypt the drinks served on this day was “black tea, lemonade or a lemon soda”. All of this was enjoyed outside as part of breakfast. People on this day try to enjoy the outdoors where they can. They picnic in parks, they picnic in the countryside, they visit zoos, anything where the breeze can be enjoyed. I’ll see if I can find other information about this holiday because if it’s something of an ancient equinox holiday like the blog mentioned it adds another holiday to my list. Categories: Holiday | Tags: holiday, Kemetic, living, Ma'at, NeoPagan, offerings | Permalink. I’ve been pretty quiet this past week. Some of it has to do with getting stuff together for the etsy store I run. This quietness, however, is not necessarily an uneasy one. I just haven’t had the time to write as I wanted due to getting some projects together in addition to the work on the etsy store. I’ve felt compelled to write, and I didn’t know about what. As I read through the negative confessions I found this one. Anyone who knows me or reads this blog regularly knows I have a language disorder called cluttering. One of the biggest problems with this disorder is trying to express myself in a concise manner. This leads to a lot of unnecessary talk. Despite my lack of word economy I seem to convey my point well enough, but I fear that I’m not always successful. That’s when my insecurities arise. While I disagree that people would prefer to air their grievances rather than remedy them it does convey the point how sometimes people need to “let it out”. When they’re clearly done and need a response, give it. Honestly, this is another area where I still trip up; I either give a response that’s too cool or inappropriate in some other manner. I know, though, part of the reason this occurs is because I misread a cue or because I misread the person’s intentions. My current remedy for this is to live, learn, and get to know the person a bit better. Apart from getting to know people to curb my need to respond inappropriately this skill also teaches me when to listen. It teaches me to listen to the person’s context as well as content. It taught me when to ignore them because they’re waxing poetics or talking (or writing) without substance. I also learned incessant talk also brings with it gossip, and these days I have little time for rumors. I still stumble in these areas, but since I’m aware of my tendencies I can learn from them. I can avoid people who gossip or prattle on about esoteric things. I can avoid most places where that type of conversation occurs. I don’t need to read tabloids or about the latest celebrity breakup since most of that has no bearing on my life. The relevance of one’s words to another person is probably one of the keys of avoiding babbling. I don’t need to waste my time or another person’s time with something that doesn’t interest them. If they find my company overall to be undesirable I can go where I’m welcome. I don’t need to incessantly speak to someone who will most likely never approve of me. I’ll save my words for the time and company for which it’s appropriate. Categories: Life Lessons, My Way of Ma'at | Tags: 42 negative confessions, belief, ideas, Kemetic, life lessons, living, Ma'at, NeoPagan, silence, words, writing | Permalink. As I’ve mentioned before bookbinding is a hobby of mine, albeit I’m not very good. So when I found a relatively simple “book” project to try as an outlet of my spring fever I figured it wouldn’t be too hard. Here’s how it turned out. It also allowed an outlet for my pre-spring fever. Instead of grabbing an envelope I made one from this tutorial. 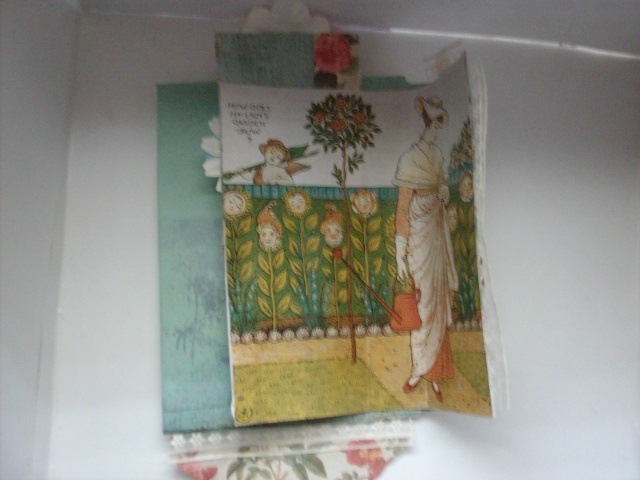 Using this tutorial allowed me to use some double-sided cardstock in lieu of the doilies and covering the envelope flap with a different paper as suggested in the book tutorial. 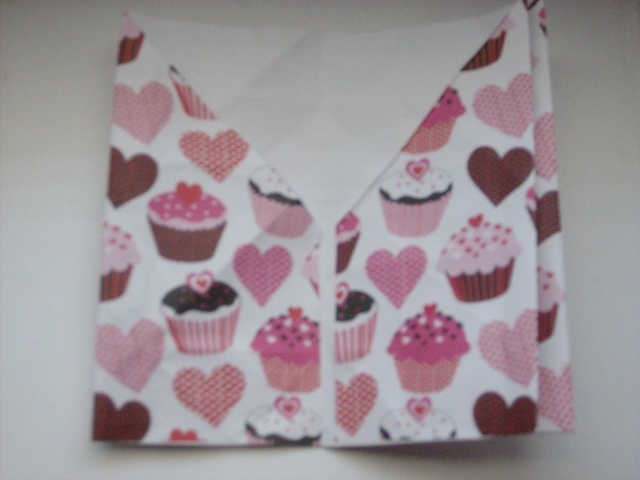 I also deviated from the book tutorial by using coin envelopes for the main pouch in lieu of the pull-out gift tag. I didn’t use gift tags for the cover either. 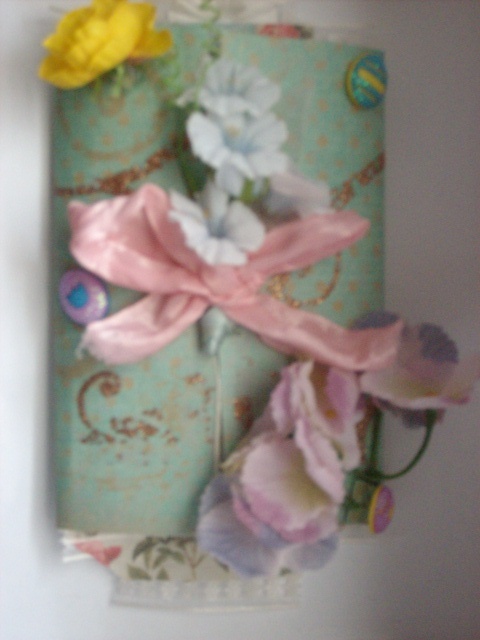 Instead I used some cardstock to make the cover, hole punched it, and decorated with my own flower pin to go inside. 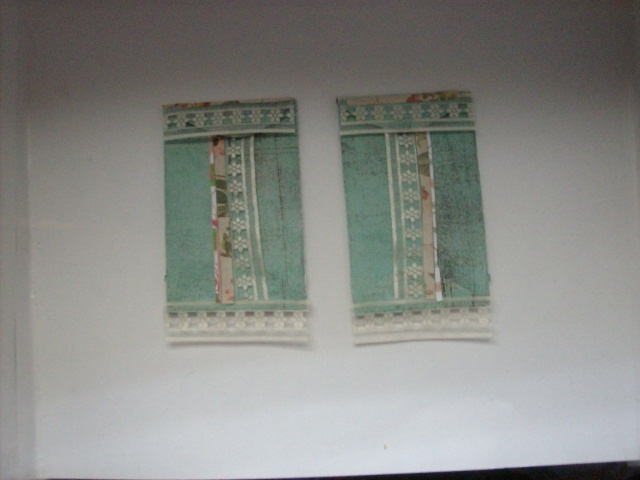 I decorated with some leftover brads from a previous bookbinding project. I also used the stickers for an upcoming project for which I can’t use for it. 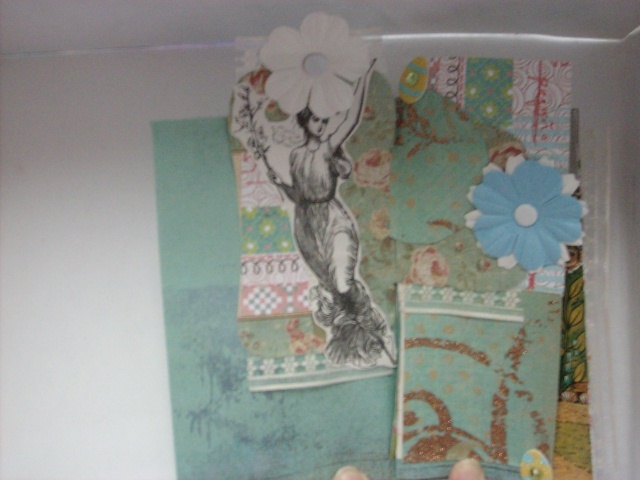 I had some pictures from a planner about fairies that I decided would work for this project. Eventually I settled on one. I tried to keep it simple. I think this page is the only time I used some gift tags. 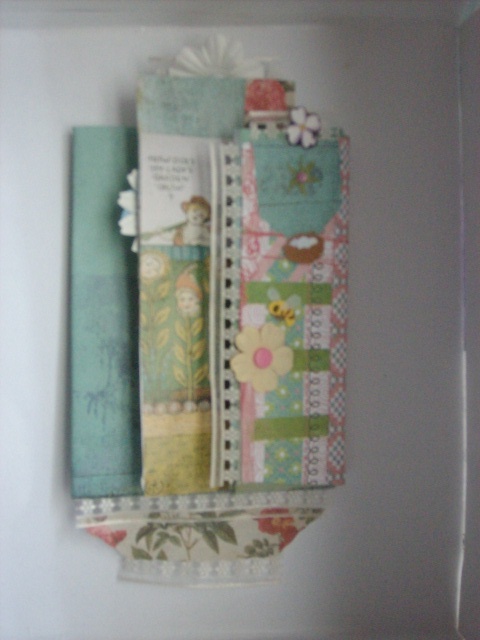 I used up the last of my brads from the other book project on this page. If you look closely you can even see my fingers. For the pouch I decorated it with some more stickers. The coin envelopes are tucked inside this pouch. Here’s a closer look at the coin envelopes, front and back. I haven’t decided what to put in there yet. I personally consider it a work in progress, but that’s fine by me. 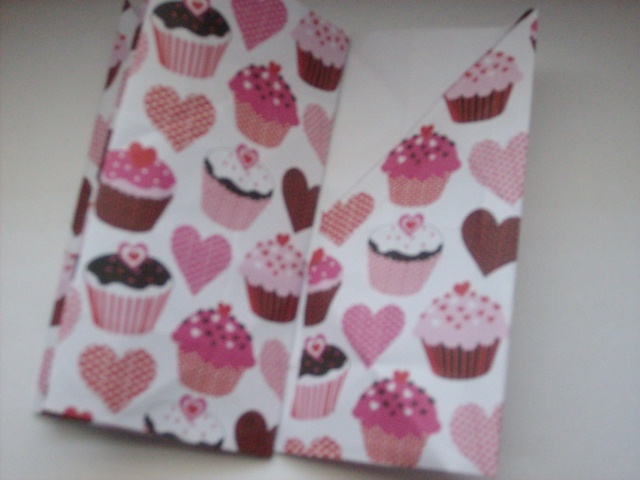 I can add as time goes on and add keepsakes in the envelopes. 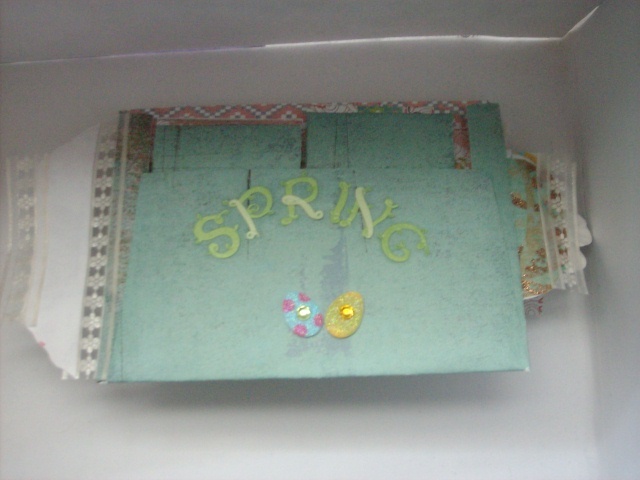 Categories: Craft Friday | Tags: books, Craft Friday, envelope, NeoPagan, spring | Permalink. If you looked at the link you’ll notice I didn’t stitch the pockets together. That’s because I don’t feel like it. Despite the fact it looks like crumpled paper and I didn’t bind the pockets I have to say I like how it looks. I’ll have to see if I can translate this to a few pockets on book covers for the next few bookbinding projects. 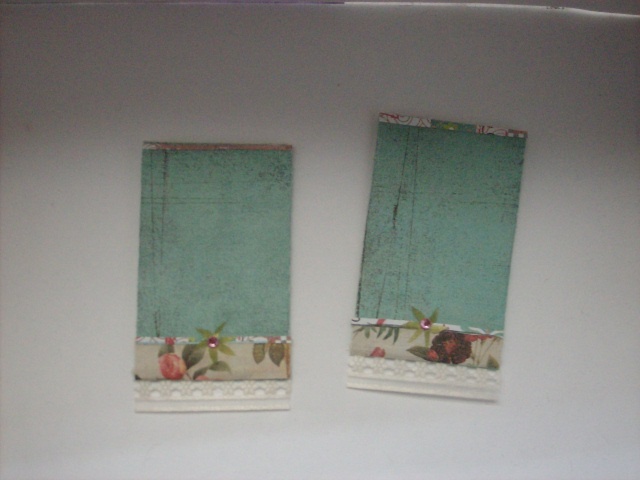 Categories: Craft Friday | Tags: Craft Friday, craft links, ideas, paper, simple | Permalink. It’s inevitable in any business one will have a needy client. It is very common in alternative paths to encounter needy people. Sometimes they come in the form of energy vampires, people who lack self-assurance or reliance, people traversing a new path completely foreign to him or her, or even just overly demanding. They may demand the session go exactly as they want (as they hand you a detailed outline), constantly call or email you with questions (it’s good to have questions, but not when it disrupts your business), habitually ask you to forgo your policies, or unabashedly criticize your practice. Whichever form (or forms!) this client manifests it leaves you, the Reiki practitioner, exasperated, drained, imbalanced, and sometimes ill. Ultimately no one truly gains with an unchecked needy client. I will admit this isn’t really the focus of my blog, but after dealing with a few needy clients I decided to look up how to handle it and found little for Reiki practices. While I found quite a bit on dealing with energy vampires not every needy client is an energy vampire. Some people are just excited to find someone to help them they get overzealous. I feel there isn’t really much in respect to this for Reiki practitioners or energy workers, and it’s one that would have been useful a few times. I decided to take it upon myself to provide some ideas that worked for me when I had to deal with needy clients. 1. Set clear physical boundaries. It seems silly and obvious to suggest it, but energy workers are sometimes too willing to help a client that this area is neglected. Sometimes we go to great lengths and will circumvent our own boundaries to that end. The willingness to help isn’t necessarily a weak trait, but it leaves energy workers vulnerable to needy clients. It doesn’t take much to set up physical boundaries. Things like clear times you will answer emails (and setting up away messages when not available), business hours, and a clear policy will mitigate some issues. Some boundaries, however, you won’t realize need establishing until a situation arrives that could violate it. I had to set up a boundary with one client because she was so enchanted by our session she wanted to camp in my yard and study Reiki under me. 2. After setting the boundaries keep firm on them. Everyone has or will experience both sides of the “but can you make an exception for me?” argument. Exceptions can’t always happen, and it’s important for the practitioner and client boundaries exist. When the client who wanted to camp out in my yard I established a boundary with referrals. I don’t teach Reiki at this time (and that incident is an example as to why) and set up a list of referrals of people I know who do teach and find superb. If you must, explain why the boundary exists, but in most cases reiteration is only necessary. 3. Shield. This is another seemingly obvious one. 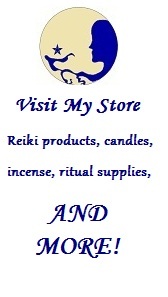 With Reiki it seems unnecessary since we aren’t using our energy as well as counterintuitive. It doesn’t matter with energy vampires. I found some use Reiki sessions as a backdoor. If one identifies as an empath it also adds another level of protection from the client’s emotions. Creating an energy shield for yourself is just another level of creating a boundary. 4. If a client sucked energy from you, check your body. Despite all precautions some needy clients manage to get your energy. I had an experience where one client managed to drain me of my energy during a session. I knew this because I suffered a headache well into the next day after the session. If you’re unfamiliar with Reiki a practitioner shouldn’t feel drained after a session. If one does it’s usually a sign personal energy was used. When the client complained I didn’t use “enough power” I had my confirmation. I left a professional reply and then performed energy work on myself. Sure enough I found a cord tied to this client. Once I removed the cord the client left a surly last word and ended contact with me (though I suspect I would have received a surly word anyway). Even if the needy client doesn’t use similar methods I advise performing energy work on yourself after an encounter. 5. Give the client tools to self-empower. This advice is especially useful for the needy client who isn’t self-reliant or feels insecure. It provides you another boundary, it provides the client with a tool to better his or her path, and it is a wonderful professional move. It also upholds part of the purpose of any work in this field: to give people a method of empowering themselves. I suspect at the heart of every needy client is that lack of self-empowerment. These self-empowering tools can be anything from a breathing exercise to as complex as showing them how to make a stone grid. 6. Know when to end the relationship. You’ve shielded yourself, you’ve set clear policies and business hours, you’ve done everything imaginable for the client. The client still insists it isn’t enough and the client-practitioner relationship is going nowhere in a best case scenario. If you’ve done everything you can and the client isn’t happy it’s time to cut your losses. You’re not able to provide what the client wants, and it may not have anything to do with you or your practice. If you can send them off politely and professionally such as, “I’m sorry but it seems you are looking for something which I can’t adequately provide you. At this point I’m ending our relationship.” Give a refund if necessary. If you can refer them to other practitioners, do it. If the client chooses to end it before you can, let them. It’s not important to have the last word. Ending it as professionally as possible not only helps the client, but sometimes leads to more business in the future. The gist of dealing with a needy client is to honor yourself, honor your work, and honor the relationship. While needy clients exist in all fields with Reiki and energy work it’s essential to utilize more safeguards against them not only for ourselves but to work for the ultimate good of all clients. Categories: Uncategorized | Tags: clients, ideas, living, NeoPagan, Reiki, simple, suggestions, tools | Permalink.